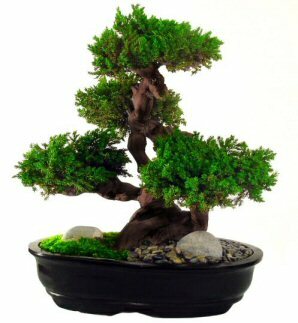 Artificial bonsai trees appears to be a very good solution when you want to go green but don’t have enough time, patience, or adequate skills to nourish a live bonsai. Those trees of high craftsmanship can be used as wonderful ornaments. You can place them on your living room table, by the window, in your bedroom, or in your office. It’s your choice because they can easily blend with almost any environment. They may be also nice gifts to your friends on occasions like Christmas or new year. Simply artificial miniature trees offer many benefits to us. Often they look very real, sometimes it’s hard to differentiate with live trees. It can maintain very well the initially-designed shape, style, and color. Because of no growth occurs, you don’t have to worry much about style break or color change. You don’t need to take care of the tree: no watering, fertilizer, pruning, pets or diseases etc. No need any knowledge of plant care, little or no attention required. At most, you just spend a couple of minutes a week to clean the leaves, trunk, and pot, that’s enough for maintenance. Surely it’ll never die. You only need to make or buy one, then leave it anywhere, even in dark corners and other areas which may be totally not appropriate for real vegetation. The synthetic tree will look almost exact the same state as when you bought it. Just remember not put it in directly sunlight for too long time to avoid fading tree colors. Preserved trees: not exactly fake plants. They were already crafted and preserved to keep their original fragrance, color, and style. Actually, those are once-real tree, not synthesis, thus tend to be more biodegradable and eco-friendly than artificial materials. 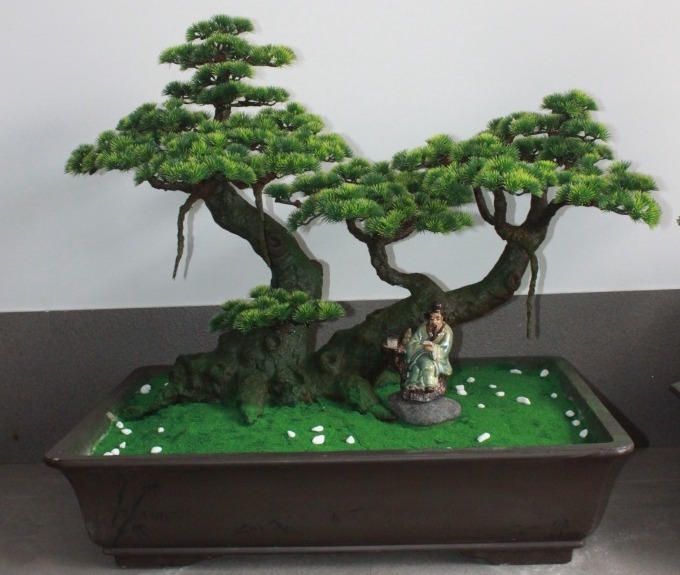 Made mainly by preserved materials, the replica is so real that it’s hard to tell preserved bonsai trees from their real cousins. Silk bonsai trees: This type’s typically made of wooden trunk and silk foliage. While it’s not so real like preserved bonsai, silk trees are biodegradable and also beautiful. Wire tree sculpture: This is creative works by bonsai hobbyists, who make bonsai from metal wire, preferably aluminum or copper. The metal trees looks so charming and natural that you may get surprised. 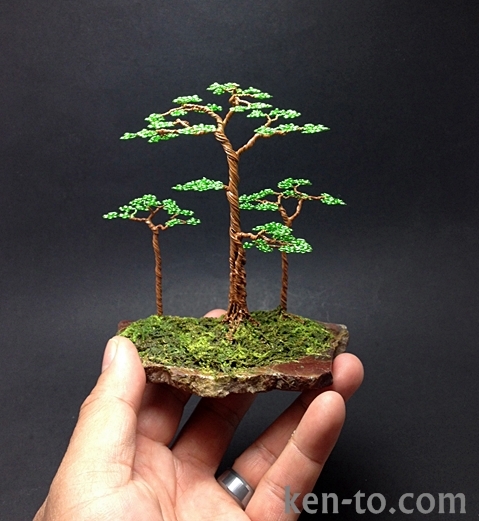 Read more about wire bonsai tree. Plastic bonsai: used to be popular, but get less and less common today because it’s not eco-friendly, and does not look real like preserved or silk trees. Where to buy an artificial bonsai tree? You can see that artificial bonsai of such high craftsmanship can be expensive, sometimes almost as expensive as live bonsai trees. So, it is a good idea to shop around and check the many different varieties that are available in the market, and compare workmanship and prices before making your selection. save some time by shopping online stores like Amazon.com or BonsaiBoy.com. They’re all offering variety of artificial bonsai for your consideration. Find out which materials the trees are made of. Trees made of high-quality and biodegradable materials can last for many years. Preferably, leaves are made of silk, trunk of Luna clay, metal or driftwood, pot of ceramic. Avoid cheap trees that made out of plastic or polyester or other low-priced materials. Try to have a look beforehand, if possible, before making purchase. Sometimes, a gorgeous bonsai in photos online may turn out to be too normal in real life. Be selective about the dealer, especially those who do not offer some kind of return policy or warranty, especially when buying online. Okay, now you have general knowledge about artificial bonsai trees, it’s time to buy one for yourself or your friends. Remember, it's not real tree, but with careful selection, you can get a 95% authenticity. Enjoy the artificial art works.